Just like the real estate market where trends are usually forecasted, there is also home improvement trends forecast for the year 2019 in which homebuyers, home sellers and investors (house flippers) are also looking into, especially if homeowners are looking to do home renovations, or house flippers buying a house that needs renovations before flipping, etc. But what exactly is the trend for home improvements to watch for the year 2019? Jamie Gold wrote about home improvement trends to watch in 2019. Read the article below to learn more. As mentioned by the author, the majority of the DIYers for the year 2019 are millennials using their smartphones searching for do-it-yourself videos on YouTube. Also, another important thing to note is the rising rental housing market, primarily in higher-end rentals in urban areas. The economy is healthy and growing, which means more job opportunities in urban areas and people are searching for properties for rent due to this increase in the workforce. Alcynna Lloyd published an article in Housing Wire about home renovation experts warily optimistic about the housing market in 2019 and the reasons behind this. A lack of affordability has prevented many Americans from re-entering the housing market, leading to a surge in the home renovation market. In fact, data from Buildfax states that within the past five years, home remodeling has surged about 30%. However, in its 2019 home renovation forecast, Houzz explains that although the remodeling industry is likely to have another successful year, many experts are proceeding with caution. That being said, Sitchinava notes that remodelers’ mood about the economy is quickly changing and clouding their business outlook. According to Houzz’s analysis, although companies maintain a positive perspective on the demand for their services in 2019, wavering confidence in the national economy is dampening their outlook. Despite the wary optimism of some house renovation experts, home remodeling industry, in general, will still have another successful year, sustaining its surge over the past five years. Add on to the huge workforce of millennials that matters a lot in home improvement and renovation growth. Sara Ventiera wrote an article in Realtor.com about millennials doing home improvement and its significance. Learn more about this article below. You can see it in Home Depot, as homeowners cruise the aisles with overflowing orange carts, and in the offices of contractors whose phones are ringing off the hook: The home improvement industry is booming. Call it the HGTV effect, which has inspired millions of U.S. viewers to knock down walls, install kitchen islands, and outfit their living room walls with shiplap so they’re Instagram-worthy. Or maybe it’s because folks have more money in their pockets thanks to a stronger economy, and want to invest in their homes. 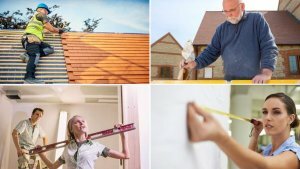 The average homeowner is taking on more improvement projects—and dropping more dough on them, according to the 2017 True Cost Survey from the national home services marketplace HomeAdvisor. “A few years back, when things were rougher, when home values were not as high, people tended to take on projects like a new toilet and sink,” says HomeAdvisor’s chief economist, Brad Hunter. Now that the economy and the housing market have improved, homeowners finally have more income, as well as more equity in their abodes—and so they’re taking on nonessential renovations to turn their homes into their dream homes. “Nowadays, it’s ‘Let’s redo the toilet, sink, tile, and vanity.’ Instead of replacing countertop in the kitchen, it’s: ‘Let’s reface cabinets,'” Hunter says. Home improvement and renovation is very important not just for homebuyers, but also for investors and home sellers as well. Home values appreciate depending on its condition. The general rule of thumb is that a house or a property that requires minimal repairs or renovations. This the reason why home improvement trends are among the most important forecasts people in the real estate market is looking forward to hearing. If you have done home repairs and renovations to your home and wanted to sell it fast, we at Dependable Homebuyers can help you sell your house fast and easy on your part. We find the right buyers for your beloved home that suits your price range. Visit us on https://www.dependablehomebuyers.com to get started.